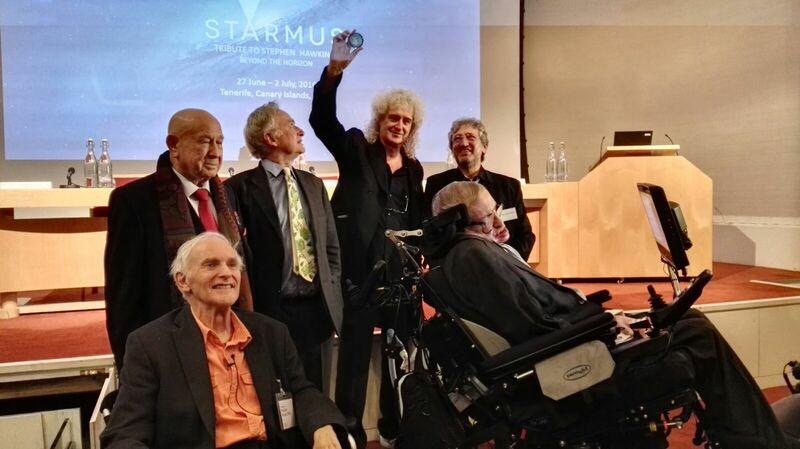 (LONDON, Wednesday 16 December 2015) A ground-breaking new award for science communication in honour of Professor Stephen Hawking was announced today at the Royal Society in London, by a panel including Prof. Hawking, the Starmus founding director Prof. Garik Israelian, Dr. Brian May, Prof. Richard Dawkins, Alexei Leonov and Nobel Laureate Sir Harold Kroto. The first of its kind, the Medal will recognize the work of those helping to promote the public awareness of science through different disciplines such as music, arts and cinema. Each year, three Medals will be awarded at the STARMUS International Science and Arts Festival in Tenerife. ‘By engaging with everyone from school children to politicians to pensioners, science communicators put science right at the heart of daily life. Bringing science to the people brings people into science. This matters to me, to you, to the world as a whole. As well as the speakers panel unveiling the Medal, many special guests participated in the press conference, including Phantom of the Opera singer Sarah Brightman, having recently joined the Starmus music panel, and renowned composer Hans Zimmer. Dara O’Briain, Prof. Brian Cox OBE and Prof. Kip Thorne were also in attendance, alongside representatives of the Canary Islands, privileged setting of the festival, including Managing Director of The Canary Islands Tourism Board, Ms. María Méndez, and the Councillor for Tourism in Tenerife, Mr. Alberto Bernabé, attended the presentation.